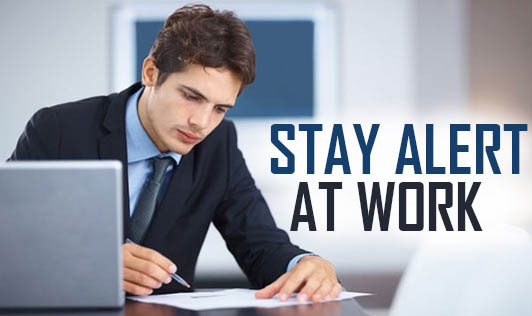 It can be difficult to stay active at work, especially if your job is grueling and painfully slow. With high demands being placed on us these days it is easy to lose concentration and focus while working to complete a task. Sometimes monotonous work can be boring and you probably can’t change the amount of time you have to work. So, you need to find ways to stay alert if you don’t want to get caught dozing at your desk. • Avoid a full stomach. Break your food consumption down into small doses rather than having a big meal. • Stay Alert by Moving the Body every thirty minutes - activities for 2-3 minutes like jumping, jogging in place, walking around and simple stretches on any part of the body that feels tense, tired, or numb. • Splash cold water on your face every hour. • Listen to music that’s energizing and gets you going. If possible hum along. Just make sure to use headphones so that you don’t disturb your co-workers. • Drink water to stay hydrated. Dehydration can cause fatigue. • Avoid the Elevator: Taking the stairs is an excellent method to fit a little bit of physical activity into your work day which helps to promote blood flow and increases your body’s metabolism. • Sit up Straight: to make a difference. • Take a power nap: If you have the time, sleep for just 15-20 minutes in the middle of the day, to increase your alertness. • Expose yourself to bright light, preferably natural daylight. If you can step outside or look out of the window for a minute, you’ll be more alert. • Massage your neck and the backs of your hands to improve circulation and ease fatigue.